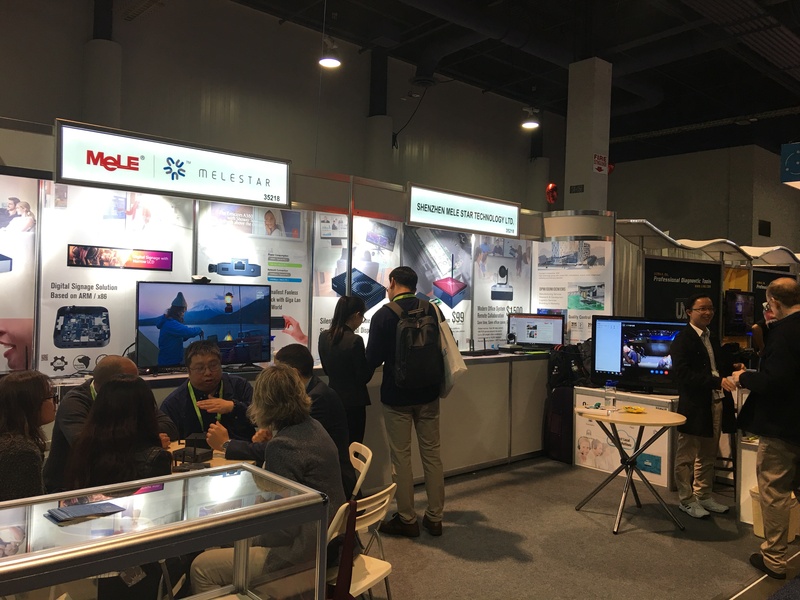 Consumer Electronics Show (CES) 2018, one of the most important international large-scale electronics fairs has been splendid opened on Jan 9 at Las Vegas. This significant activity last four days until Jan 12. Since 2007, Shenzhen MeLE Star has been attending this annual event for the 12th times, and introducing the latest INTEL based Fanless Mini PC. New products based on Intel 7th Generation Kaby Lake CPU (support up to 32GB DDR4 Memory) from $99 for distribution was introduced, and then the World Smallest PC Stick (0.14Liter in size) includes dual network capabilities with built-in Gigabit Ethernet /Dual Band AC Wifi based on Latest Apollo Lake up to Pentium class CPU was also showcased. And then is the Smart Video conference system targeting small and medium sized businesses also powered by one of the hot selling Mini PC (Model PCG35APL1) with simultaneous dual display for sharing powerpoint or other documents for remote office collaboration is also in demo and attract a lot of attention with the MSRP of around US$1,500 and an operating subscription cost from only US$5 per month per conference room. This system with built-in HD 12X/1080p optical zoom camera, with 72.5° Wide angle and pre-install Windows 10 Professional OS and powerful video conference application system It supports up to 250 video conference sessions together and or live broadcast up to 10,000 audiences at same time, meeting participants can invite any third-party to join the meeting by Web link(Cross-platform service: Windows PC / Mac / iOS / Windows Phone / Android) , support Remote control / Electronic whiteboards / Online voting / online storage, remote sharing Screen / PPT / Application.,easy for Recording & Replay video conference. 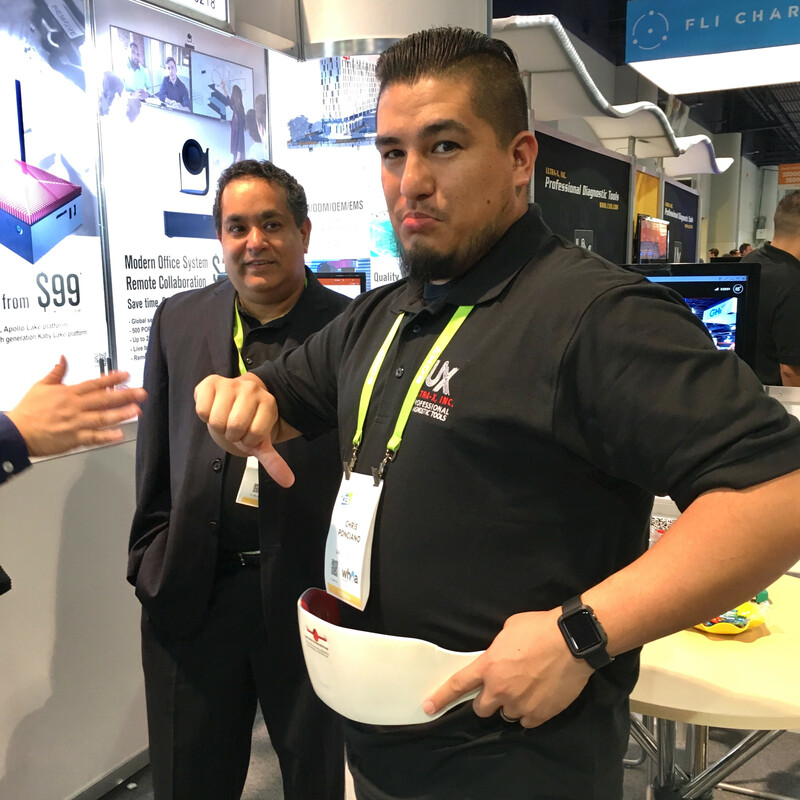 MeLE Star introduced new electronic diet belt. This belt applies LED Light therapy to melt down the fat and vibration to burn the fat, realizes portable and comfortable wearing,and reach the goal of body weight control and Physical body shape easily. Last, but not least, also introducing smart racing car running up to 60KM/hour with operating distance of up to 120 meter and up to 35 minutes play time for each full charged session. Shenzhen MeLE Star is a global leader of internet High-definiton and system solution provider. MeLE Star advanced products are sold in over 80 countries and regions in the world.